It’s another visit to Blackpool for the latest tram to feature as part of the Picture in Time series with an image of Blackpool Ex-Towing Railcoach 679 in 1993. Built as Second Series English Electric Railcoach 279 in 1935 the tram was converted into a Twin Motor Car in 1961 although was never destined to be permanently coupled to its Trailer. Renumbering followed in 1968 with the tram receiving the identity of 679 and then just four years later its matching trailer – T9/689 – was withdrawn from service leaving the tram as an orphan and it continued to operate as a solo Railcoach all the way until the end of 2004 when it was fully withdrawn from service itself and acquired by the Lancastrian Transport Trust. Work soon started on converting the tram back into an English Electric Railcoach with pointed ends but this then stalled and 679 has now become part of the expanded Blackpool Heritage Fleet and is considered a project for the future when the work already undertaken will be completed allowing it to return to service. In the photo we see 679 at a busy Bispham on 31st August 1993 carrying an all over advert for the Isle of Man Steam Packet Company. 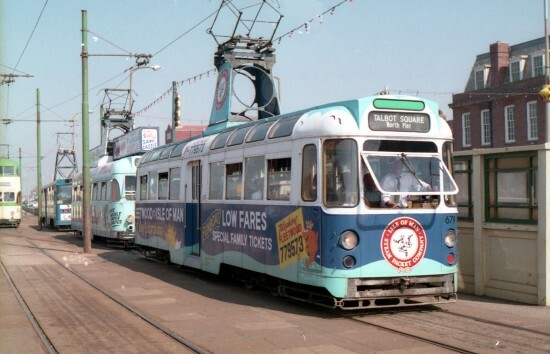 This version of the livery remained on the tram for three years before being replaced in July 1994.